Congratulations to the winner of the 2014 Atlanta MyShadi Bridal Expo Mehendi Competition, Manisha Panjwani of Manisha’s Mehendi Designs! Learn more about Manisha, her winning design, and the services her company offers. I am originally from Mumbai, India. I attended St. Louis High School in West Mumbai (Andheri) and also have a degree in Commerce. I am happily married and have a four-year-old daughter. For those who are not familiar with you or your work, can you share a bit on the formation of your business? 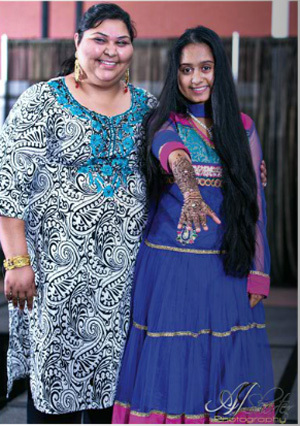 I first began my mehendi business in India about 10 years ago. I began by practicing on my family and friends, and when I realized how much I enjoyed applying henna, I decided to go into business for myself. In the United States, I have been in business for over three years. What I like most about my work is seeing my clients’ faces light up when I am able to give them exactly the particular design they are looking for. My work is so rewarding. 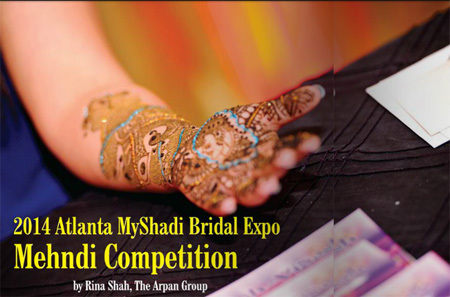 How does it feel to be the winner of the 2014 Atlanta MyShadi Bridal Expo Mehendi Competition? It feels great! I am so honored to be the winner of the 2014 Atlanta MyShadi Bridal Expo Mehendi Competition. Thank you for choosing me! Your passion for this art form is evident. What inspired you to become a professional mehendi artist? I was inspired to become a professional Mehendi artist when I realized that I could turn my passion into a business venture. Since I really enjoy what I do, it doesn’t feel like work to me. It feels more like a ‘calling’ because I get to bring smiles to a lot of people’s faces by creating designs especially for them. What inspired your winning mehendi design? Bridal designs have always been an inspiration to me, as this is one of the most important days of a woman’s life. It is the one day a woman gets to feel like a queen, and I am inspired by the joy and happiness my Mehendi bridal designs bring to the bride and to her entire bridal party. My service is not limited to brides as I happily provide mehendi services for family members and wedding guests. The biggest lesson I learned in my first year in business was patience. I had to be patient with myself mostly as I learned how to become a more experienced and creative Mehendi artist. The biggest lesson I learned in this past year of business is that I must continue to develop myself professionally during the lean months when business is slow. Since the bridal industry is seasonal, I like to use my downtime to learn new techniques and to attend professional development conferences. My favorite wedding that stands out was my cousin’s Sania’s wedding. It was so special to me because we grew up together in India and had remained close since coming to live in Atlanta. It stood out to me the most because I was the artist she chose to apply not only her Mehendi, but also to her entire wedding party, which were members of my family, too. I will always cherish that memory. The economic climate affected the U.S. wedding industry in a profound way over the past years, including the normally untouchable high-end segment of the market. To what extent did it affect your business? The economic climate affected my business to the extent that I had to come up with some creative ways to make sure that my prices were reasonably low when bidding wedding jobs. Brides deserve the best quality for their money, so I would sometimes offer to provide a free sample to assure them that they were in good hands. I provide my services in metro Atlanta and the surrounding areas. I am also willing to travel as far as the need arises. What advice do you have for brides planning their wedding? The best advice I can give to brides planning their wedding is to have fun! Too many times brides get caught up in the details of wedding planning and become so stressed that they forget to enjoy the beauty of their own wedding. A part of my job as a Mehendi artist is not only to create stunning designs for brides, but also to remind them to be patient, relax, and enjoy! Find Manisha’s Mehendi Designs on Facebook or e-mail manishasmehendidesigns@gmail.com for more information. Rina Shah is the CEO and founder of The Arpan Group, a boutique public relations firm that specializes in developing campaigns to capture untouched ethnic markets. From press releases and media kits to marketing materials and by-line articles, The Arpan Group customizes solutions based specifically on the client’s needs. For more information, visit www.thearpangroup.com or call (703) 651-6670.